From the design of service counters, retailers are focusing on brand innovation as well as historic strategies to keep their stores relevant. Despite all the media focus on e-commerce, grocery retailers are making sure they don't take their eyes off their store design concepts, which is where the overwhelming majority of consumers prefer to shop for their fresh produce. From tech-innovations to a renewed emphasis on business practices grocers are combining the past with the new to keep their stores relevant in the digital age. 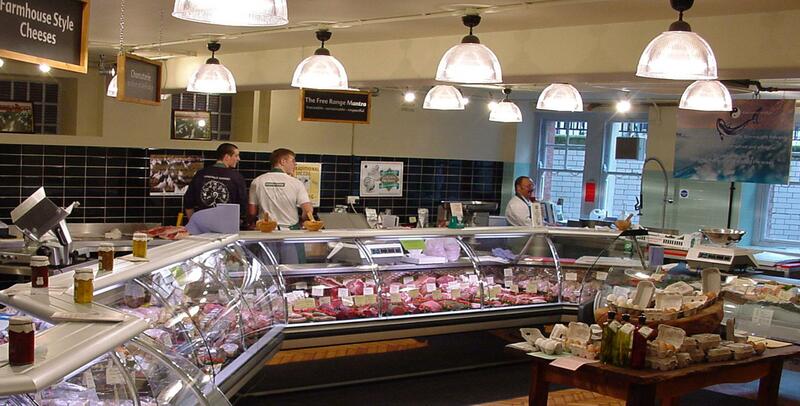 Factory prepared butchery provides convenience for the retail supply chain. However, this type of supply chain has lost contact with what consumers are looking for in their grocery goods and services retail brand. When working in Poland with a leading wholesaler EuroCash, who owns the franchise Delikatesy Centrum convenience store retail chain. I discovered the value of an in-house staffed meat department in less than 200sqm stores. Grocers have come to acknowledge the value of a fully staffed meat department in a local community can add real value. In addition to providing fresh cuts and a friendly face, butchers can answer the question supermarkets are increasingly looking to answer their customers. What can you recommend that is now in season? Can you give me 650grams, not 1Kg? How long should I marinate the meat and which marinade is best? Many of these issues can be dealt with during the design of the stores. We think locally grown foods are still going strong and grocers have tapped into demand by increasing their assortment, promoting their local producers and holding “meet the farmer” style events in stores. There are a number of Grocers who are taking the concept of “local” a step further by partnering with vertical farming operations to source produce from a few miles away. Some retailers have also asked their designers to bring the farm to the store. 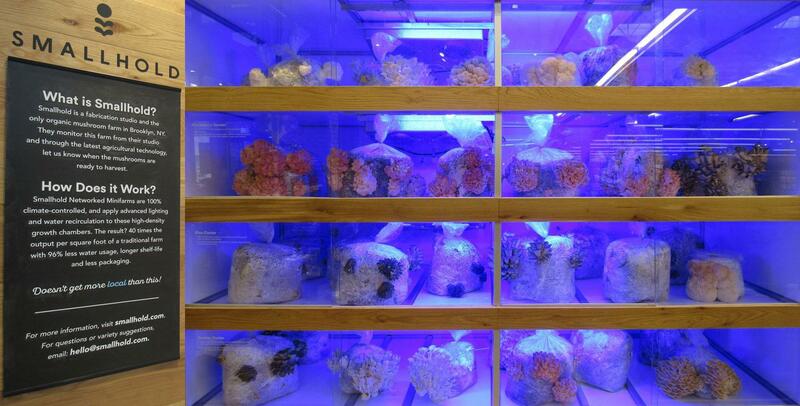 When Whole Foods opened their Bridgewater store in New Jersey they featured a mushroom farm that generates up to 54.5Kg of fungi a week for the store and it was Smallhold, a New York City-based organic farming startup, who provided the in-store cultivation display. Meanwhile, Hy-Vee built a hydroponic “grow wall” outside its store in Davenport, Iowa last year, which supplied up to 7Kg of herbs and lettuce for the store each week. 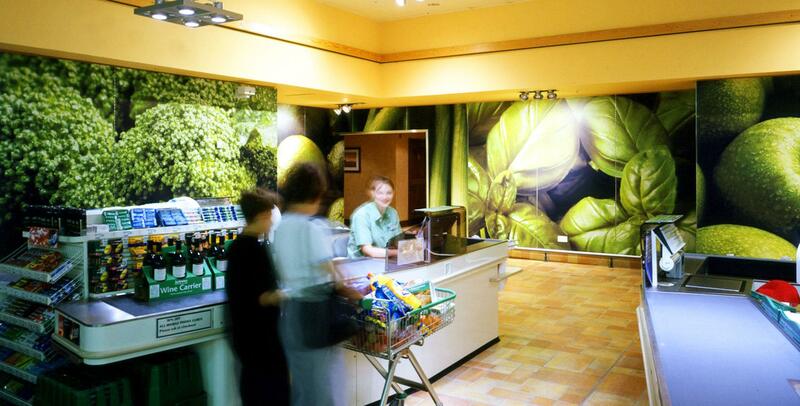 Campbell Rigg believes supermarkets have a blind spot. They carry aisle after aisle of meal ingredients, yet they don’t show their customers how to put everything together. Some retailers now feature large culinary classrooms where shoppers can learn everything from knife skills to diabetes management. And believe it or not the trend has already taken root in the DIY sector at retailer Leroy Merlin and in the Electronics sector at Apple and Media Markt. Whilst the connection between food, health, wellbeing and medicine grows, Campbell Rigg believes, so will the opportunity for retailers to underpin their connection with shoppers through education. Staffing additional cashiers, installing more registers or overhauling front ends altogether can alleviate the problem. But many grocers think they’ve found a more cost-effective solution in scan-and-go apps that let speed-focused customers check out with their phones. At a time when online shopping is growing and checkout-free store Amazon Go has captured the industry’s eye, grocers are under pressure to not just alleviate checkout lines, but to make the experience enjoyable, too. Dollar General’s DG Go! the app automatically applies coupons and alerts customers to additional savings while they shop. The company plans to have 250 stores online by the end of this year.